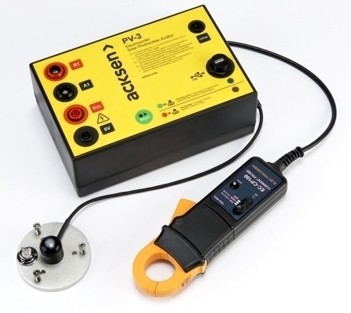 Setting up the Electrocorder PV-3 is easy, suitable for semi-technical staff. Using the supplied (free) Windows software, Electrosoft; the location's details are input to the unit's memory and stored. Electrosoft will then print documentation allowing users to record and/or pass on delivery instructions to colleagues. All data is also stored in a database of dispatches and returns, which tracks the whereabouts of all units. Why is the Electrocorder better than other similarly priced competitors? The Electrocorder range use a constant sampling technique, unlike the single reading of competitors. When the loggers start to record, they sample every channel 16 times per cycle, a cycle is 16ms at 60Hz and 20ms at 50Hz. At the end of each averaging period, 3 quantities are saved for each channel, the TRMS average, the Max, which is the highest cycle value during the period and the Min, lowest cycle value. This means that it will record all the peaks and troughs which are one cycle or longer. When recording the Electrocorder will store the average voltage (and current if applied) over the period chosen (1 sec to 60 min), it will also record the highest (max) & lowest (min) cycle values during that period. The voltage levels are stored with dates and times. With the back-up battery, the Electrocorder can continue to record for 4 weeks. An external 12Vdc PSU input is available, to allow for prolonged logging without batteries. This model is specifically designed to accurately monitor one or two DC voltage channels, 1V to 60Vdc. Allowing you to monitor charger performance and PV (photovoltaic) cell output, as well as many other applications like DC motors. There are many models of Electrocorder, to suit many logging situations and user's requirements. The product KIT is supplied with two fused voltage input leads, DC current probe, pyranometer, USB lead, 12Vdc PSU, software and carry case. Two voltage input channels and one current channel . Records VAvg, VMax & VMin on 2 channels. Data is stored in non-volatile memory. Memory capacity of 32,000 TRMS voltage values per channel (10 bit), up to 300 days continuous recording. Accuracy:- 1V - 5V < 2% of reading. 6V - 60V < 1% of reading. 60V - 300V ~2% of reading (300V Model). Order code:- PV-3-IP43-KIT, PV-3-IP65-KIT, PV-3-300-IP43-KIT and PV-3-300-IP65-KIT.